Clockwise from top left: Catherine Opie, Lothar von Falkenhausen, Elisabeth Le Guin and Sylvan Oswald. 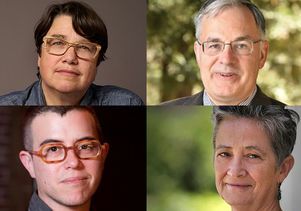 Four UCLA professors have been awarded fellowships from the John Simon Guggenheim Memorial Foundation — Elisabeth Le Guin, professor of musicology; Catherine Opie, professor of photography; Sylvan Oswald, professor of drama; and Lothar von Falkenhausen, professor of Chinese archaeology and art history. 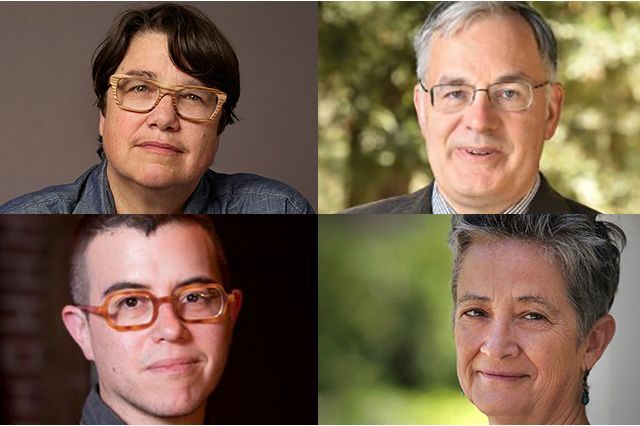 Guggenheim Fellowships are awarded to a broad range of scholars, writers and artists based on prior achievement and exceptional promise. The foundation awarded 168 fellowships this year, the program’s 95th. In all, 49 scholarly disciplines and artistic fields from 75 academic institutions are represented in this year’s class of fellows, who range in age from 29 to 85. Elisabeth Le Guin, who is chair of the musicology department in the UCLA Herb Alpert School of Music, is a performer and musicologist whose dual allegiances manifest as a series of dialogues, in tones and words, between theory and practice. She helped found Philharmonia Baroque Orchestra and the Artaria String Quartet. Her second book, “The Tonadilla in Performance,” won the 2015 Kinkeldey Prize from the American Musicological Society. She is a 2016 recipient of the UCLA Distinguished Teaching Award. Le Guin’s Guggenheim Fellowship was awarded for a community-project based in Santa Ana, California, called El Cancionero de Santa Ana. The project aims to reflect, translate and enhance the complex cultural life of the largely Mexican immigrant community in which Le Guin has lived since 2014. She will be working in coordination with the community of local musicians and activists at El Centro Cultural de México. Catherine Opie, professor of photography in the UCLA School of the Arts and Architecture, is an artist working with photography, film, collage and ceramics. Opie’s photographs include series of portraits and American urban landscapes, ranging in format from large-scale color works to smaller black and white prints. Moving from the territory of the body to the framework of the city, Opie’s various photographic series are linked together by a conceptual framework of cultural portraiture. Her work has been exhibited extensively throughout the United States and abroad. Opie was a recipient of the Smithsonian’s Archives of American Art Medal in 2016 and the Julius Shulman Excellence in Photography award in 2013. Recent projects include a permanent photographic installation for the new Los Angeles Federal Courthouse in 2016, and her book, “700 Nimes Road,” a portrait of Elizabeth Taylor, was published by Prestel in 2015. She debuted her first film, “The Modernist,” at Regen Projects, Los Angeles in 2018. As a Guggenheim fellow, Opie will continue to explore people’s visual conversation with photographs and especially how images are disseminated in the media today. She will be working with photography, collage and stop-motion animation for this new project. Sylvan Oswald is an assistant professor of playwriting in the UCLA School of Theater, Film and Television. An interdisciplinary artist, he creates plays, texts, publications and video. His language-driven work uses metatheatricality and formal irreverence to challenge structures of identity. Current projects include “Trainers,” developed at The Ground Floor at Berkeley Rep, and “High Winds,” co-created with graphic designer Jessica Fleischmann (X Artists’ Books, 2017). Oswald has since adapted “High Winds” for performance featuring music by Jerome Ellis and has begun to present the show at venues such as Abrons Arts Center and the LAX Festival produced by Los Angeles Performance Practice. Other recent work includes the lo-fi semi-improvised web series “Outtakes” starring Becca Blackwell and Zuzanna Szadkowski, and the play “A Kind of Weather,” which will receive its world premiere at San Diego’s Diversionary Theatre in 2020. As a Guggenheim Fellow, Oswald will write a text responding to Virginia Woolf’s “Orlando” from a trans perspective. An active field archaeologist, Falkenhausen was co-principal investigator of an international archaeological project on ancient salt production in the Yangtze River basin (1999-2004) and since 2010 has served as instructor of record of the International Archaeological Field School at Yangguanzhai, Xi’an. In 2012, President Obama appointed him to the state department’s cultural property advisory committee, which advises the president on preventing the illicit trade in antiquities. As a fellow, Falkenhausen plans to finish a monograph on the economy of continental East Asia during the eight centuries or so preceding the unification of China by the first emperor of Qin in 221 B.C. This period saw the transition from a regimented, elite-centered gift-giving economy (or prestige-good economy) to a market economy that was at least partly monetized. Since its establishment in 1925, the Guggenheim Foundation has granted more than $360 million in fellowships to more than 18,000 individuals, among whom are scores of Nobel laureates, Fields medalists, poets laureate, members of the various national academies, and winners of the Pulitzer Prize, Turing Award, National Book Award, and other internationally recognized honors. The Guggenheim Fellowship program remains a significant source of support for artists, writers and scholars in the humanities and social sciences, and scientific researchers.